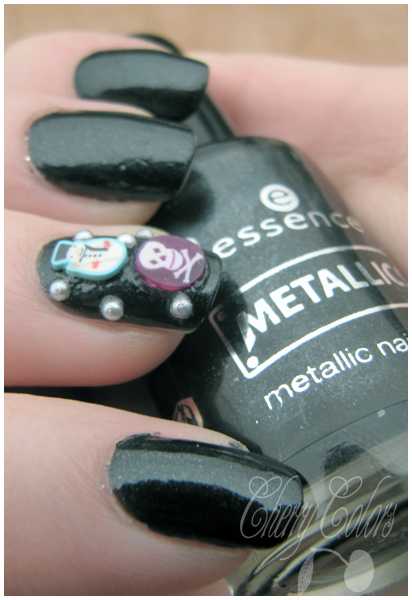 NOTD: Crazy Snowman + Essence Metal Battle - Cherry Colors - Cosmetics Heaven! Yesterday I managed to chip my nails and because I was feeling really lazy, I applied the fastest drying nail polish ever. It's From the Metallic Collection (TE) and it's the only one that it's not magnetic. It actually is a wonderful deep black with silver shimmer in it. Sadly the shimmer is only visible under strong light or sun. And we don't have any of them atm. But then the black polish looked too black, so I added a couple of fimo clay cuts and pearls. Sadly the snow flake fimo clay cuts became all mushy and weird, so I took them off and added bears + skeleton heads.